Pressure on the ulnar nerve at the elbow can develop in several ways. The ulnar nerve is positioned right next to the bone and has very little padding over it, so pressure on this can put pressure on the nerve. For example, if you lean your arm against a table on the inner part of the elbow, your arm may fall asleep and be painful from sustained pressure on the ulnar nerve. If this occurs repetitively, the numbness and pain may be more persistent. 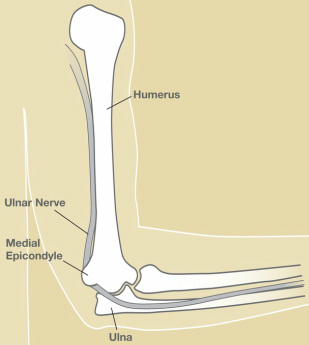 In some patients, the ulnar nerve at the elbow clicks back and forth over the bony bump (medial epicondyle) as the elbow is bent and straightened. If this occurs repetitively, the nerve may be significantly irritated. Additionally, pressure on the ulnar nerve can occur from holding the elbow in a bent position for a long time, which stretches the nerve across the medial epicondyle. Such sustained bending of the elbow may tend to occur during sleep. Sometimes the connective tissue over the nerve becomes thicker, or there may be variations of the muscle structure over the nerve at the elbow that cause pressure on the nerve. Cubital tunnel syndrome occurs when the pressure on the nerve is significant enough, and sustained enough, to disturb the way the ulnar nerve works. Figure 1. Ulnar nerve at elbow joint (inner side of elbow). Cubital tunnel syndrome symptoms usually include pain, numbness, and/or tingling. The numbness or tingling most often occurs in the ring and little fingers. The symptoms are usually felt when there is pressure on the nerve, such as sitting with the elbow on an arm rest, or with repetitive elbow bending and straightening. Often, cubital tunnel symptoms will be felt when the elbow is held in a bent position for a period of time, such as when holding the phone, or while sleeping. Some patients may notice weakness while pinching, occasional clumsiness, and/or a tendency to drop things. In severe cases, sensation may be lost and the muscles in the hand may lose bulk and strength. Cubital tunnel syndrome symptoms may sometimes be relieved without surgery, particularly if the EMG/NCS testing shows that the pressure on the nerve is minimal. Changing the patterns of elbow use may significantly reduce the pressure on the nerve. Avoiding putting your elbow on hard surfaces may help, or wearing an elbow pad over the ulnar nerve and “funny bone” may help. Keeping the elbow straight at night with a splint also may help. A session with a therapist to learn ways to avoid pressure on the nerve may be needed. When cubital tunnel syndrome symptoms are severe or do not improve, surgery may be needed to relieve the pressure on the nerve. Many surgeons will recommend shifting the nerve to the front of the elbow, which relieves pressure and tension on the nerve. The nerve may be placed under a layer of fat, under the muscle, or within the muscle. Some surgeons may recommend trimming the bony bump (medial epicondyle). Following surgery, the recovery will depend on the type of surgery that was performed. Restrictions on lifting and/or elbow movement may be recommended. Therapy may be necessary. The numbness and tingling may improve quickly or slowly, and it may take several months for the strength in the hand and wrist to improve. Cubital tunnel syndrome symptoms may not completely resolve after surgery, especially in severe cases.